The purpose of this study was to evaluate the medium-term follow-up results of a series of ten perilunate dislocations treated operatively at least three weeks following injury. The intervals from injury to treatment of the delayed and the chronic groups were four weeks (range, three to six weeks) and 17 weeks (range, 11–25 weeks), respectively. The average follow-up time was 90 months. Surgical procedures included open reduction, internal fixation, grafting, ligament repair, and external fixation. Clinical function was evaluated by the Cooney clinical scoring system. The radiological assessment included the radiolunate angle, scapholunate angle, the revised carpal height ratio, and presence or absence of midcarpal arthritis. In the delayed group, there were two excellent, one good and one poor results. The average postoperative clinical score was 81 (good). In the chronic group, there were four good, one fair, and one poor results. At the last follow-up, the average postoperative clinical score was 76.7 (good). 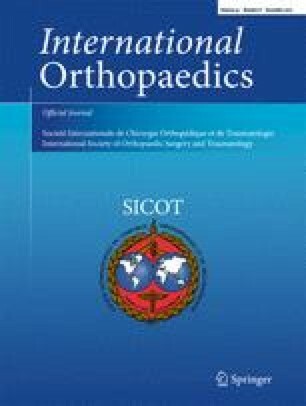 Our results indicate that open reduction and internal fixation can be applied in the treatment of delayed and some of the chronic perilunate dislocations and achieve satisfactory results.